FTTH connection: this is the Fiber to the Home technology which promises connection speeds of up to 100 megabits per second (Mbps) — 20 to 100 times as fast as a typical cable modem or DSL (Digital Subscriber Line) connection. MU-MIMO: Multi User Multiple Input Multiple Output. The antennae configuration can be any combination from 1×1 up to 4×4. Therefore, the data streams don’t need to be shared up to 4 devices connected to the same router. The signals being transmitted by the various antennae are multiplexed by using different spaces within the same spectral channel. Most of the routers started implementing only downlink MU-MIMO. 2.4 GHz and 5 GHz bands: the former provides up to 4 non-overlapping channels in most of the countries, while the 5GHz adds up to 23 non-overlapping channels . Also, the interference in this new band is smaller and the collision number is reduced. Optical Fiber input: this is the green point in the left side. It’s connected to a chip that converts the information in the light domain to the digital domain for the Ethernet, WiFi, voice and TV services. The ROM: this is the chip you can see in the middle of the board. The firmware of the router is stored here. The CPU: the grey chip is the processor, which runs the OS instructions like the system startup and the routing function. RAM: one of the other chips is this memory which contains the OS, the configuration commands, the routing table, the ARP cache which stores the IP-MAC mappings and the buffer for the buffer before they go through the interfaces. Flash Memory: this other chip stores the OS permanently. The OS is temporary stored in the RAM when the system starts. Four antennae: this implements the WiFi 802.11ac technology mentioned above. You can observe the printed antennae in the picture below. As mentioned earlier, the antennae increase the data rate by adding the data transmitted by each antenna in parallel. Therefore, with 4 antenna we can get a theoretical maximum of 1,7000 Mbps (by multiplying 433 Mbps by 4, and rounding 1,700 Mbps). In the WiFi 802.11n, we add the data rate every two antennae: 2x 150 Mbps (300 Mbps). They have different sizes and locations and the are protected with metal to isolate them and avoid damaging the processor. Older routers have the antennae outside the router and the users could adapt them. 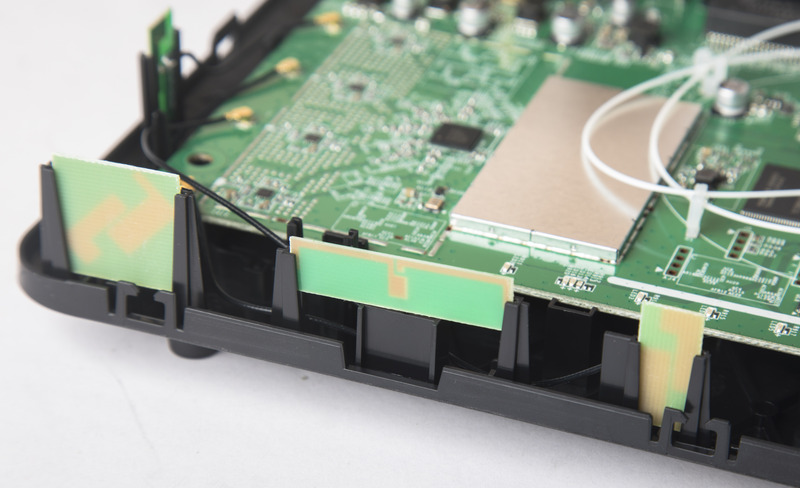 Serial ports: In the following picture, we have highlight inside a red squares the serial connectors. 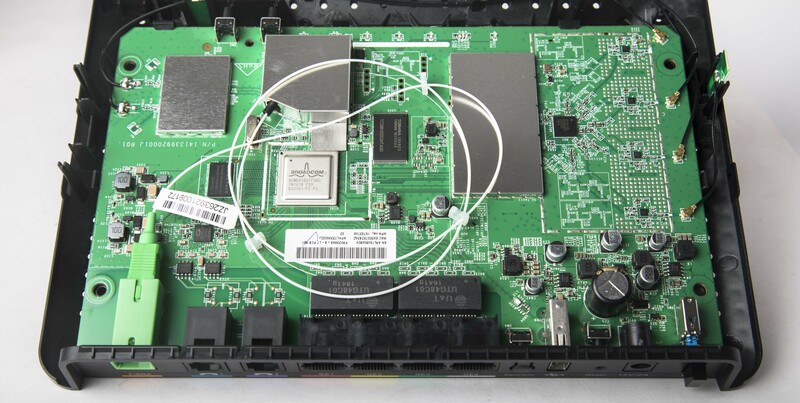 These ports are aimed to configure the antennae and the CPU of the router. You can have more flexibility to configure your router by connecting to these ports than you do when you use the IP connection to see the router’s GUI. However, you need to know the specific commands of the manufactures. We hope your curiosity is now released 🙂 Specially because some companies don’t allow users to open the routers. Anyway, these components are built, configured and placed to operate optimally. We hope you enjoyed this post, and we’ll be pleased to know your thoughts in the comments or by email.